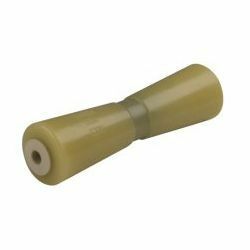 Thermal Plasticized Rubber (TPR™) rollers are an economical, non-marking replacement for standard black rubber rollers. TPR™ is long lasting, softer & more compliant than rubber. Self-lubricating Delrin™ bushings-no grease required. Fits standard brackets with 5/8" shaft size. C.E. Smith Trailer Rubber Deep V Keel Roller - 12"
C.E. Smith Trailer Rubber Deep V Keel Roller - 10"
C.E. Smith Trailer Rubber Deep V Keel Roller - 8"
C.E. Smith TPR Trailer Deep V Keel Roller - 8"
C.E. Smith TPR Trailer Deep V Keel Roller - 10"